These days working in Vincennes exhaust me like a sedative taken when one cannot sleep, and precious sleep itself becomes work to find fresh again. The last few weeks have seen me becoming listless enough to begrudge what I can’t have. All this has been reminding me of what’ll never be the same and is always lost. To be sure, we share in what’s gone. The best of these dark days have been sleep worthy. I’ve been dreaming again, entering that valued space where a waking fantasy cannot recreate what the dreaming mind will manifest on its own. I’ll write of a specific dream that causes me considerable worry, but not enough to become frightened off by the powerful images that are to be remembered as I make note of them here. Shivering, I found myself near Heidegger’s hut on Todtnauberg (Death-Mountain), located in the Black Forest somewhere in obscure southern Germany. This tiny place is the famous retreat of Heidegger’s, where he’d eventually put together Being and Time. He found his peace here, away from them, the crowds he hated so much. 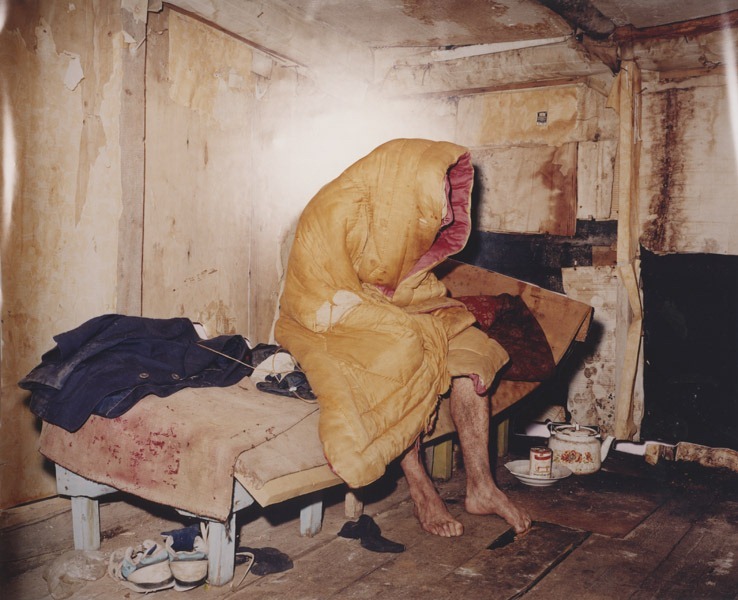 In this setting I was expecting to find the old woodcutter busy at his typewriter, instead I found a dirty white-haired Nietzsche wrapped in a sleeping-bag as if he were homeless. I could safely say he was homeless here on Death Mountain, as summer was wearing off and a withering fire was put in motion to affect a little warmth for the now run down place. I instantly knew this was an older Nietzsche, a man who was here after death. Here we were together in my dream, Mr. Deleuze and Mr Nietzsche looking through each other for the first time. While my mind’s eye pieced the scene together, he pulled out an insistent translucent arm and pointed near to where I stood, “See, this is the tarantula’s hole! Do you want to see the tarantula itself? Here hangs its web: touch it so that it trembles.” I immediately knew to what he was referring to, and I was a little put off by the idea that he could be referencing himself as the tarantula. I had to quickly dismiss this because I detected that characteristic ironic sneer. The tarantulas in his Zarathustra were there to represent the poisonous people who sit around and wait self-righteously to attack those who are living freely, as he saw it. The life-affirmers live instead of contemptuously waiting to react and bite like the spider. He wasn’t here waiting for anyone, let alone me. Although I shuddered at his macabre reference, I had to agree with him, to barely mutter under my breath, “Everywhere we see victory of NO over Yes, of reaction over action.” His blurry crossed eyes glared towards me, he then stared out to the single window, and then Nietzsche became fixed on an odd photo of an overburdened camel on its fore-knees. The camel carries the heavy load of past morality, those tired values that are not yet gone and weigh the poor animal down, just like we are weighed down. No one had to tell me what this symbolized once I recognized it in the picture, tossed there on that greasy floor. Surely, I had been toying with all these ideas of his lately, which could explain why he was performing as he was, without so much as an obligatory hello. It is unfortunate that philosophy should have ever become a condemnation of life. Thought over life is not worth living. “Of all these heaviest things the carrying spirit takes upon itself, like a loaded camel that hurries into the desert…” His outsized yellow-white mustache looked to be a burden as he said this. The legendary facial hair was a part of the mask he couldn’t do without. We want put these burdens upon ourselves as the ancients did when they privileged lofty thought over the fallible body. His mask was faded, yet couldn’t ever be an equivalent to these age old restrictions. “We are always asked to submit ourselves, to burden ourselves, to recognize only the reactive forms of life…,” I half said this aloud and to myself. I couldn’t tell if he knew I was still there. He was still listlessly looking out the window. I walked over to look out too. To my amazement, I could see a bright golden lion wandering around a clearing in the forest some hundred feet away, his fur was more radiant than blond. The animal’s presence over there assured me that I was in the company of my god-less hero, the master of allegory, a man of health and of suffering, this was a man of foreword looking visions. His cracking voice then lightened and became youthful as he talked about the lion, “Once it loved ‘thou shalt’ as its most sacred, now it must find delusion and despotism even it what is most sacred to it in order to wrest freedom from its love by preying.” This was the golden lion of my homeless visionary, the critic and destroyer of stagnancy that was tirelessly represented by the old ways. Nietzsche had to proclaim the death of god as a way to solidify his place in the transvaluation of Christian nihilism, as he was also the harshest critic of the requisite nihilism that resulted with god’s absence. Man could be empty without a god, getting rid of the divine solved only a fraction of man’s problems. We had to look for answers from within ourselves, and we had to crawl out of those arcane devotions to those ascetic religious and secular illusions with the new-found courage of a lion. I had to leave the hut to get a closer look at the precious lion. I’d never see it again, this was my last chance to say goodbye to that myth of his. Walking out into the clear air only revived my fear that this beautiful scene would be ending soon. Everything is to return only as difference, a repetition of movement becoming a force of will. Becoming is a force of life immanent in our lives moving forward, changing us always. This will never be the same, and it’ll never be the self-same drama of our dreams again. I walked out and found no lion, and I easily cried, thinking that these tears would somehow replace that which once was. Acceptance of our pain only brings about a minor comfort. Life requires creative and experimental force to keep us from devaluing it any more than we should. I awoke with these last words and all I could say, as strange as it sounded on my lips, was ‘YES to life! YES to life!’ Only a child that once was the now dead Nietzsche in my dream could help me see this as I never have before. This was all I needed to move on, to think ahead and to live my life as never before. Nietzsche, Friedrich, Thus Spoke Zarathustra, eds. Adrian Del Caro and Robert B. Pippen, Cambridge: Cambridge U. Press, p. 76. Deleuze, Gilles, Nietzsche / Pure Immanence – Essays on a Life, intro. John Rajchman, trans. Anne Boyman, New York: Zone Books, p. 75. Nietzsche, Friedrich, op. cit. : p. 16. Deleuze, Gilles, op. cit. : p. 71. Nietzsche, Friedrich, op. cit. : p. 17. 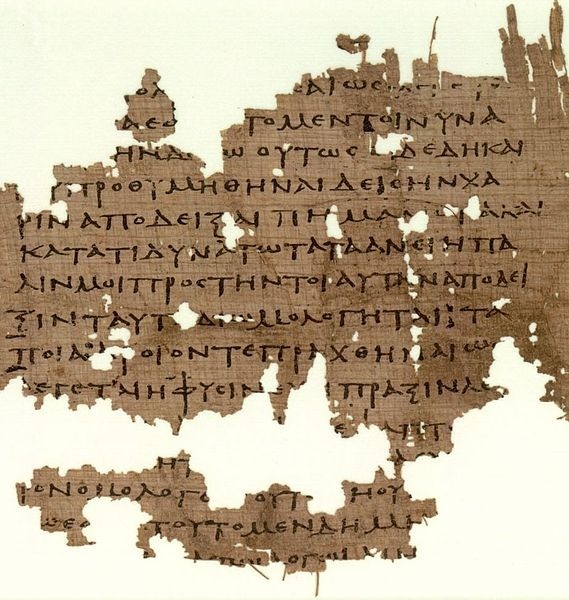 Papirus Oxyrhynchus, with fragment of Plato’s Republic. “…okay, we’re back at the library as you asked, it’s always an interesting challenge to see if I can keep my voice down to library volume. I’ll jump into it right away to simply ask you about the dialogue form and how that relates to philosophy.” A little out of breath Maze looks to Mr. Diamond who, of course, has been reading the whole time Maze was talking. It’s not clear if he heard him. The stack of books Mr. Diamond has is on Plato and the Greeks—this puts Maze a little more at ease. Maze thought about this and remembered that the dialectic could be a refinement of this way of exchanging and receiving ideas to get to higher knowledge through dialogue. The acquisition of knowledge is not something to be attained by the senses, but by the intellect. Plato, The Republic, Intro. and notes Elisabeth Watson Scharffenberger, Trans. Benjamin Jowett, New York: Barnes and Noble Classics 2004, p. 247.